The Frameworks Institute is a non-profit organization that is well known for its ability to change the general public’s understanding of social issues. 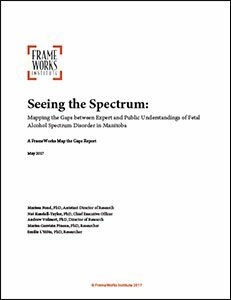 The Frameworks Institute recently completed a report for the LAEO project and its partners (CanFASD Research Network, Manitoba Liquor and Lotteries and Addictions Foundation of Manitoba), which highlights expert and public understanding of FASD in Manitoba and “maps the gaps” between them. The report is called “Seeing the Spectrum: Mapping the Gaps between Expert and Public Understandings of FASD”.